MOVIE REVIEWS It is rare to find an animation let alone Christmas movie released by an Australian studio. Neither have been a fixture in the local landscape, which makes the two for one package of Santa's Apprentice that much more appealing. Interest piques even more that it's in 2D, a risqué move considering that Pixar-inspired computer animation has been the norm for years now. Santa's Apprentice Starring: Shane Jacobson, Jake Versace, Delta Goodrem, Magda Szubanski, Georgie Parker Directed by: Luc Vinciguerra Rated: G Running Time: 77 minutes Distributor: Becker Entertainment Group The 2D animation may look simplistic but don't be fooled: there is a certain charm felt throughout Santa's Apprentice. Both in look and narrative this is a film which harkens back to a certain type of storytelling where the character of its characters and moral in its story are just as important as the visual presentation. Grandparents, parents and little ones will get something out of it. Kids above the age of 12 might not be so impressed. 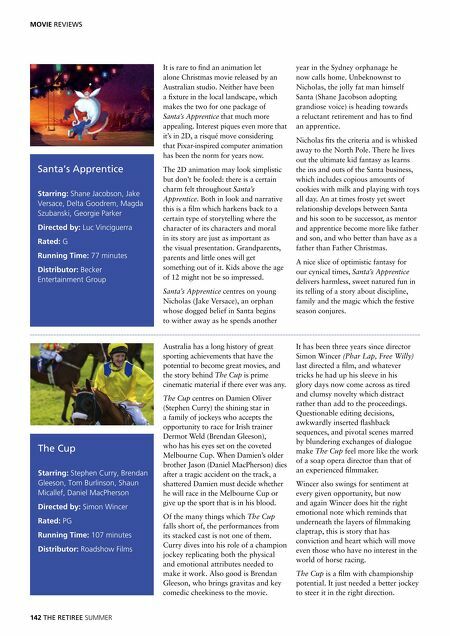 Santa's Apprentice centres on young Nicholas (Jake Versace), an orphan whose dogged belief in Santa begins to wither away as he spends another Australia has a long history of great sporting achievements that have the potential to become great movies, and the story behind The Cup is prime cinematic material if there ever was any. The Cup Starring: Stephen Curry, Brendan Gleeson, Tom Burlinson, Shaun Micallef, Daniel MacPherson Directed by: Simon Wincer Rated: PG Running Time: 107 minutes Distributor: Roadshow Films The Cup centres on Damien Oliver (Stephen Curry) the shining star in a family of jockeys who accepts the opportunity to race for Irish trainer Dermot Weld (Brendan Gleeson), who has his eyes set on the coveted Melbourne Cup. When Damien's older brother Jason (Daniel MacPherson) dies after a tragic accident on the track, a shattered Damien must decide whether he will race in the Melbourne Cup or give up the sport that is in his blood. Of the many things which The Cup falls short of, the performances from its stacked cast is not one of them. Curry dives into his role of a champion jockey replicating both the physical and emotional attributes needed to make it work. Also good is Brendan Gleeson, who brings gravitas and key comedic cheekiness to the movie. 142 THE RETIREE SUMMER year in the Sydney orphanage he now calls home. Unbeknownst to Nicholas, the jolly fat man himself Santa (Shane Jacobson adopting grandiose voice) is heading towards a reluctant retirement and has to find an apprentice. Nicholas fits the criteria and is whisked away to the North Pole. There he lives out the ultimate kid fantasy as learns the ins and outs of the Santa business, which includes copious amounts of cookies with milk and playing with toys all day. An at times frosty yet sweet relationship develops between Santa and his soon to be successor, as mentor and apprentice become more like father and son, and who better than have as a father than Father Christmas. A nice slice of optimistic fantasy for our cynical times, Santa's Apprentice delivers harmless, sweet natured fun in its telling of a story about discipline, family and the magic which the festive season conjures. It has been three years since director Simon Wincer (Phar Lap, Free Willy) last directed a film, and whatever tricks he had up his sleeve in his glory days now come across as tired and clumsy novelty which distract rather than add to the proceedings. Questionable editing decisions, awkwardly inserted flashback sequences, and pivotal scenes marred by blundering exchanges of dialogue make The Cup feel more like the work of a soap opera director than that of an experienced filmmaker. Wincer also swings for sentiment at every given opportunity, but now and again Wincer does hit the right emotional note which reminds that underneath the layers of filmmaking claptrap, this is story that has conviction and heart which will move even those who have no interest in the world of horse racing. The Cup is a film with championship potential. It just needed a better jockey to steer it in the right direction.